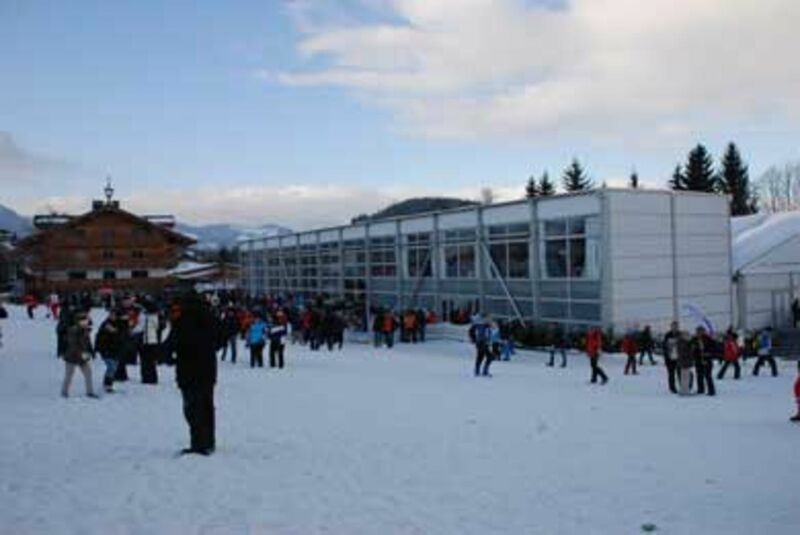 I have seen it creeping in over the last few years at the Kitzbuhel Hahnenkamm – a more sanitised, safer and less disorderly Kitzbuhel Hahnenkamm race weekend. I started going to the race weekend annually around 10 years and was blown away by the excess, celebration, bravery, setting, atmosphere – it really was an assault on all the senses. The centre piece was of course the mind blowing race track that drops down the side of the mountain above Kitzbuhel. The Kitzbuhel Hahnenkamm is the stuff of skiing myths across the world and to see the event live defies belief – I have yet to see an event that is more incompressible to my senses than the Kitzbuhel Hahnenkamm (and I can ski to a reasonable level). To many, the partying on the slopes before, during and after the race is a side-show that is (/was) at best excessive and at worst gruesome. And yes in such a beautiful setting where nature is so fragile to see the vast piles of crushed beer cans, spilled gluhwein and collapsed revellers isn’t pretty for sure. But what struck me those years ago were the passionate, obsessive fans who came from all over Austria and beyond to celebrate their heroes. Bag checks followed a few years ago, more security guards are in evidence and fences are now enveloping the Strief – the fences for me symbolise the efforts to take the race out of the hands of the traditional spectators. Wooden steps are welcome for some but this is a mountainside, a race track that used to be a challenge to climb, cling to and then descend after the race – all part of the challenge to join those men who threw themselves down slopes of fearsome gradients. And whilst all the changes are not to be bemoaned the sanitising of the Kitzbuhel Hahnenkamm is clearly impacting the fan base and changing the visitor profile. The vast and sumptuous Audi sponsored corporate HQ at the finish area represents a direction that the race organisers are taking the race – and for me it is tragic. In taking the race from the fans and giving it to the paying VIPs the race organisers are stripping the heart out of the event. By charging spectators (even those who have already bought ski passes) at the upper section of the course, for me is directly subsiding the monstrous, if high end ‘VIP world’ at the finish line. And what of the young fans that used to party their valley asses off? Generations grew up in mass hysteria and undoubted excess once a year in January in Kitzbuhel, watching their heroes defy logic. These guys are the future of snow sports, just as twin tips and snowboards are – sanitising their one truly over the top day of mountain excess will drive them to Air and Style and similar events. And what of the Kitzbuhel Hahnenkamm – it will continue with an older crowd (me included) that will be ever more pandered to. This isn’t F1 – it ski racing and its most brutal, fearsome and celebrated – only its heart is being stripped, year by year as the celebrities are ushered in. Tragic.